JARM stands for "Just Another Ruby Mod". 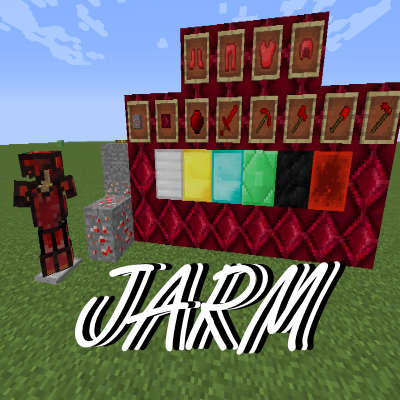 JARM adds in two blocks, Ruby Ore and Ruby Block. Ruby Block is usable for beacon bases and is craftable like any other "storage" block. JARM also adds in multiple items. The Ruby Gem is the most memorable item from the mod because that is a texture mojang made but was edited by myself. JARM has a Prismarine helmet that adds water breathing and night vision. JARM also adds in lapis lazuli and emerald tools and armour and shulker armor which negates fall damage. The ruby tool-set is slightly stronger than diamond. All materials are modular and can be disabled in the config! How many different ores are going to be added with this mod once its finished?? And also whats the point of ores that have the same stats as diamond/iron etc. The mod currently has all the ores i plan on adding. Any plans for tinkers construct support as an optional extension? Can u edit YOUR DANK MEMUS mod to 1.12.2? I want to ask you a question..Can I repost this mod to a Chinese minecraft forum named MCBBS?It is the largest minecraft forum in China.I think Chinese will like it very much. And because of some problems,if you allow me,I need to create a download link in China. If you allow me,I will link the curseforge page. 1. have your mod work with orespawn3 (just like basemetals does) so you can control the spawn rates better. I just started playing now with this mod and when i break the blocks no ore drops. so far tested Uranium and Jade. Is this normal or maybe i need a higher level pick axe. I would like to use the JARM types of ores with my progressive tools mod if i can get this to work. This is currently normal however i am looking at changing certain ores to lower levels (at the moment minimum is diamond). the ores blocks when you break them they don't drop ores. which means they are useless. Personally, i use a mod called progressive tools to change the value needed to mine the ores. The issue isn't the values used to mine them. The issue is once they break, no ore is spawned. Also in the jei there are images of the tools and armor but not the ore.
hey i reset the config file and it worked again. must been something i did in config that caused the blocks to not drop items when mined. thanks for the mod very awesome glad to have it working again. I would like to use the JARD types of ores with my progressive tools mod if i can get this to work.